These presentations will focus on issues critical to attendees who want to stay on top of the latest industry trends and technologies. APCO’s Chief Counsel will provide a brief update of the association’s top advocacy priorities. When disasters strike, everyone has something of potential value to contribute. History shows us at that we really do create better outcomes when we all work together. The future of technology is about to redefine what we believe is ‘Us’ while offering new ways to Prepare, Respond, Recover & Rebuild. Interactive discussion of the FirstNet Response Operations Program, a key component of the Nationwide Public Safety Broadband Network. Discussion includes 2018 success highlights from Hurricane Florence, Hurricane Michael and the California Wildfires. The panelists will answer questions from the audience. 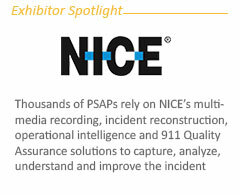 This presentation will focus on five challenges and opportunities for emergency call taking: address database management to improve outdated data, aggregation of data between regional jurisdictions, strategies of capture IP-based intelligence, 3D visualization and location accuracy, and mobile capabilities for first responders. We will include demonstrations of solutions to address these common challenges. 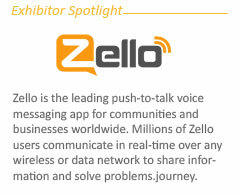 Bill Moore, CEO, Zello Inc. The future of emergency communication will see fewer radios and more smart devices. Hear about how phones already replaced radios during Hurricanes Harvey and Irma, when a push-to-talk app became the most downloaded in the world. Then learn about how these apps help organizations save lives and resources. FirstNet staff will provide an update on a Roadmap and guidance principles that will ensure investment in the FirstNet network reflects public safety feedback and priorities for their communications needs. Experience how an incident unfolds from call to case closure in an integrated, end-to-end suite maximized to help responding agencies work more effectively and efficiently. This compelling narration to the Project 43 demonstration, based from APCO’s report on “broadband implications for the PSAP,” illustrates how “future” solutions are actually available today – from Motorola Solutions. FirstNet supports Mission Critical Push to Talk (MCPTT) solutions and configurations in a number of ways based on the needs of the users and the incident they support. This presentation outlines scenarios where FirstNet MCPTT can support first responders along with the varied configurations and solutions that can be leveraged.